Along about twenty years ago, mindfulness came into my life. At the time, my own children were young and day to day living was anything but mindful. It was life changing and helped introduce me to yoga, which helped to prepare me for my inevitable open heart surgery 6 years ago. I jumped in to see how I could relate my mindfulness practice with my “work” as a grandmother. Nothing is more important to me than family, children and grandchildren. 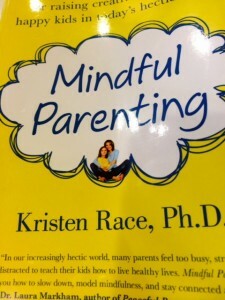 Kristen Race has helped me to effectively live the mindful life with my granddaughter in today’s fast paced world. She explains in clear and simple terms how our brains work and how our stress effects our own overall well being and that of our family. She goes on to give many helpful techniques to implement in our busy lives. Her tips help you to find the balance that is essential to manage stress. Balance is an integral part of living happier lives through “mindful parenting” and “mindful” grandparenting. This is a book I will continue to read and dog ear the pages for years to come. It is one I will recommend to friends. As a therapist myself, I will recommend it to parents as a must read to help them parent mindfully! Disclosure: This was a sponsored post. I was given a copy of “Mindful Parenting” for review.